The IWC Portofino models are renowned for their superb, understated aesthetics and this new IWC Portofino Hand-Wound Pure Classic model captures the essence of simplicity of the collection perfectly. 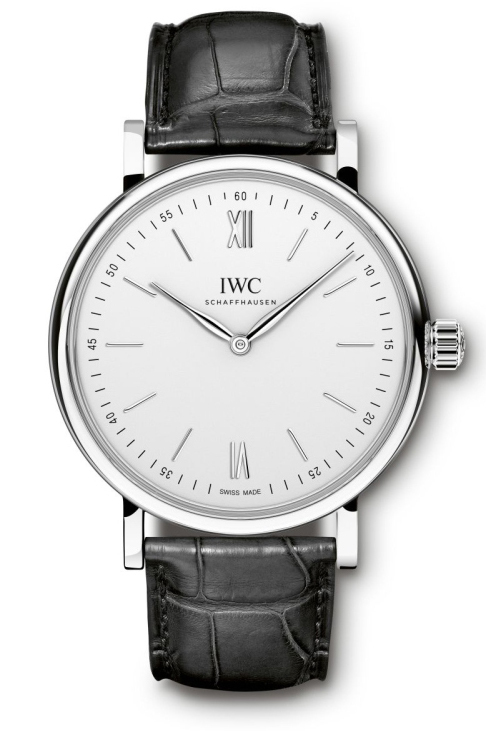 In 2014 IWC paid particular attention to their Portofino collection, unveiling a new and extensive range of mid-sized pieces aimed at enthusiasts who prefer smaller case sizes. However this new model marks a return to more generous proportions, ensuring that there is an abundance of empty dial space to enjoy. The dial has been styled to be entirely clutter-free - so much so that even the indication which keeps check on its substantial 8 day reserve of power has been relegated to the back and the seconds hand has been dispensed altogether. All that remains on this pristine face are whisker-slim hour markers, slender Roman numerals at the 12 and 6 and a tidy chapter ring. 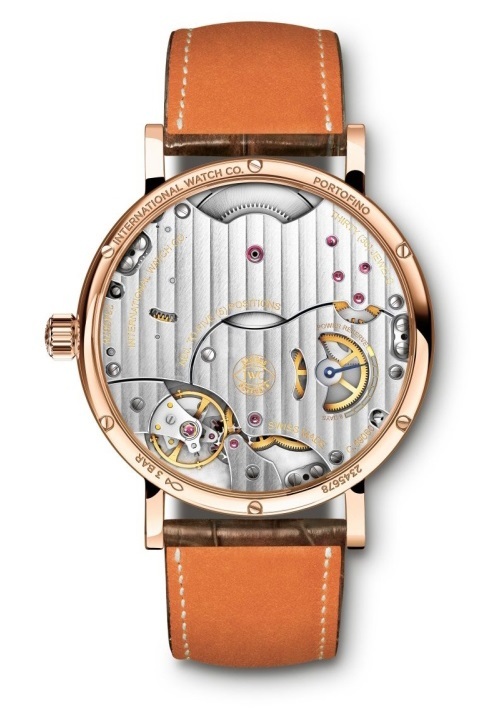 Through the rear case-back crystal some of the inner workings of the IWC manual-wind Calibre 59060 are revealed, appearing through apertures cut into the bridges which have been adorned with an orderly Geneva Stripe decoration. The result is a clean, marginally industrial yet beautiful arrangement which is in-keeping with the restrained character of this piece. Two case options of the IWC Portofino Hand-Wound Pure Classic will be available - 18kt red gold or steel - each measuring 43.5mm across and each featuring the trim bezel and pert crown synonymous with this collection. Rhodium-plated hands and indices catch the light on the dial of the steel edition, but the red gold edition paired with an über-quality Santoni brown leather strap makes for a particularly eye-pleasing combination. The IWC Portofino Hand-Wound Pure Classic 8-Days model forms part of IWC's new collection to be unveiled at SIHH 2015, more details at the IWC official website.